Something a little different from the usual recipe post. If you've ever wondered why in the heck I do what I do, or why some full-blooded Nigerian girl from a - let's be honest - meat-obsessed culture would be crazy enough to suddenly do away with all animal products, then this post will hopefully shed some light on the matter. I suppose this is my way of giving some sort of shape to the origins of my vegan journey. In hindsight, my decision to stop eating animals involved a lot more than the singular desire to simply 'improve my health'. I'll take you right back to the beginning... from thoughts I had as a child, through to my 20 years of forgetfulness and being enamoured by meat and diary, right to the precise moment I picked up and rejected my last piece of chicken and decided that there was no turning back. I questioned a lot of things as a child, and still do to this day. It's always been in my nature to challenge the status quo, never content with the dismissive and boring: 'this is the way things are and are supposed to be'. It's no big surprise then that this questioning extended to society's food choices. There is nothing unique about this and it is my belief that as children, we all have a heightened sense of curiosity with regard to the world around us; the world that we are getting accustomed to. Over time, our belief systems and values become more defined and set in stone. It becomes harder for us to shake off or even begin to question certain actions and behaviours that we have been taught are 'normal' and 'natural'. Although my older self could come up with a million ways to rationalise meat-eating (based on what society had told me), the hypocrisy that my younger self picked up on effortlessly was a real and valid issue which would unfortunately lay dormant for several years to come. In my entire life, I have only witnessed two animals being killed in front of my very eyes. The first and most memorable time was at my grandparents' house in Ibadan when I was around 6 years old. The whole family was there for a week or so before a big wedding was to take place. I can't remember if it was during the holidays or whether us kids had been given time off from school. Either way, it was one of the best weeks of my life - full of fun and all the quintessential childhood enjoyment that comes with being with all your siblings, cousins and friends in the same house at once. We stayed up to play card games, ate a lot of delicious home cooking and spent hours exploring the large compound. On one particular day before the actual wedding, a small group of us were running around the compound as usual when we came across a large cow that was literally strung upside down, it's belly torn open and its guts being pulled out by people I imagine were animal slaughter experts. We put two and two together and realised that the cow was going to be used to feed the guests at the wedding. As any normal child would do at the sight of something so violent and disgusting, we ran in the opposite direction as fast as we could. Before we went into the house to recount our tale of adventure to the busy adults, however, a family friend who is slightly older than I am decided to have a little fun and told me that it was very important for me to add in my story that the cow's soul should rest in peace. And so in we went.. 'Guess what? Guess what? We saw the insides of a cow! May its soul rest in peace!' If the adults were too occupied in their various tasks to initially turn their full attention my way, the last part certainly got them. Laughter. Followed by an adult educating me on the fact that there was no need to say 'rest in peace' because it was 'just a cow' and 'not a human being.' Naturally, I wondered why it had to be that way, but I knew better than to ask. That was the way of the world. It was okay for humans to rest in peace, but animals were just animals and didn't matter. When it came to dairy, the concept of milk was the first time I properly made the connection between what I was eating/drinking and where it actually came from. For many years, I had a hard time drinking milk because the thought that it came straight out of a cow grossed me out. Even today, I find it hard to chug down a plain glass of almond or soya milk because it reminds me of cow milk. In spite of this, I had a copious amount of milk growing up. How? Well, I had the powdered milk brands to thank for that. In a busy city like Lagos, it is rare to buy fresh milk. Powdered milk brands such as Dano and Cowbell are the order of the day, and those milk powders were darn delicious to me back then. I would never mix mine with water to make a drink, but a bowl full of the powder was gold. Presented in this form, I was able to suppress the knowledge that it originated from a cow; it was simply sweetened powdery goodness. I'm adding in all these flashbacks because they do help give some context to my vegan story and go some way to explaining why I became so receptive to the concept. We never had pets growing up, I rarely interacted with animals, and inevitably, I became your average meat-eater. I loved the stuff. Chicken wings? Yes, please. Sausages and eggs for breakfast?Couldn't ask for anything better. Don't even get me started on ice-cream. I forgot all the questions I had about the origins of my food. Everything I found in the store was up for grabs and mine to enjoy to the fullest. It was my right to eat what I wanted. It was the normal way to eat. 20 years went by. This is where several factors seemed to collide at once. To give some background, I was in France on my year abroad (3rd year of university). During my first internship placement, I lived with a family that owns a little dog named Lucky. Being in France in general, I was in the land of meat, dairy and more dairy. Cheese courses, heavy meat dishes for lunch...you get the picture. Perhaps it was the fact that I didn't have crazy essay deadlines weighing down my thoughts, perhaps I just had way too much free time on my hands, but while I was there I found I had the luxury to extensively ponder my general health and well-being. With the copious amounts of animal products I was consuming, along with how much I loved looking after Lucky as a pet, old questions that had long been buried seemed to rise to the surface. There was a near-absurdity about the way meat and dairy appeared in almost every meal throughout the day; it was like an overdose. There was an absurdity to the way I felt so attached to Lucky and yet could happily consume the flesh of another animal. I sometimes have this bad habit of stating the obvious (although it's often a case of me attempting to get at the heart of a commonality by saying it out loud to myself before dissecting it in my mind) and I remember sitting down one day, glancing at Lucky and saying: 'I could never eat you.' Seems random and a bit comical, but the wheels in my brain were spinning...I was making the connection...I was reviving that child-like awareness of the hypocrisy that comes with loving some animals and treating others as faceless, worthless objects to satisfy our taste-buds. If I'd spent the last 5 months bonding with a piglet and not a dog, the feeling would have been the same. The thought of eating the piglet would have been revolting, just as it'd be revolting to eat Lucky. It'd be like eating a friend and coldly calling it a piece of 'bacon' to make myself feel better about it. I don't really care if this anecdote results in me being labelled a 'bleeding heart'. The connection was made and that was that. So while all this stuff with Lucky the dog was floating about in my mind, I was also thinking about the health side of things, as I mentioned above. I wanted to feel less sluggish and I wanted to clean up my diet. I gave up meat for a week as a trial and the detox effects were immediate. Uncomfortable for a couple of days as my body adjusted, and then I started feeling great with all this energy I never imagined I could experience. When I went back home for the Christmas holiday, I used that time to dig a little deeper and carry out some research. If I was going to carry on, I needed to know the ins and outs of such a lifestyle. The term 'veganism' came up in my research. I'd never paid attention to the term before but all of sudden, there was a word that encapsulated the lifestyle I was leaning towards. I knew enough about vegetarianism and I may very well have settled on that, but with more research came the conviction that I didn't want to be a part of any form of exploitation. As a book-worm, I bought as many books on the topic as I could. I read The Kind Life by Alicia Silverstone, By Any Greens Necessary by Tracye Lynn McQuirter, The China Study by T. Colin Campbell, Eating Animals by Jonathan Safran Foer, etc. I didn't stop there and went on to watch documentaries such as Earthlings, Forks Over Knives, Food Inc. and Vegucated. I watched YouTube videos on the topic, read articles on the lifestyle and on how animal products contribute to many of the medical conditions we see today such as heart disease, high blood pressure, cancer, diabetes etc. I pretty much put myself through a crash course on all things concerning veganism and it made logical sense to me. It was a chance (and choice) to enjoy better health, to take a stand against animal cruelty, to contribute to a more sustainable planet and to be that bit more consistent in my desire to be a compassionate being. It wasn't so much about reaching some state of perfection or succumbing to some trivial hippie ideology, and being vegan certainly doesn't make someone innately better than everyone else - I've met my fair share of vegans with questionable characteristics and I still have plenty of bad days when I don't fully live up to all the moral standards of my faith. Scratch perfection...It was more about how my head and heart aligned on the issue. The veil on the dominant discourse surrounding how and why we use animals the way we do had been lifted and I simply had no reason to turn a blind eye. The initial realisation that I was going to fully commit to veganism was a double-edged sword. On the one hand, I felt a strong conviction and things like not buying leather seemed easy enough. On the other hand, I kept thinking: 'what the heck am I going to eat now?' Society suddenly seemed like hostile territory, incapable of catering to the vegan palate. Wondering about all the delicious things I might miss out on, I did what any right-thinking person would do: I googled images of vegan chocolate cake. I was sold. If I could still enjoy a slice of chocolate cake whenever I wanted, then I had very little to worry about. One night as I was serving myself some dinner, I picked up a piece of chicken, looked at it for a second and slowly placed it back in the pot. That was the last time I attempted to eat a piece of meat. If you've made it to the end of this post, thanks for reading! If you have any thoughts or questions, feel free to send them my way. I'd be particularly interested in hearing what you think about how your home, culture and society have shaped the way you think about food. If you're a vegan, I'd also like to hear about how you got started. Wow, thanks for sharing your story. I've never thought about not eating meat - I just really like seafood and chicken A LOT! I guess being zoophobic too doesn't make me feel like I shouldn't eat meat. Thank you for sharing your story! As a 2nd generation Nigerian living in the US. I always felt over westernized especially because of my diet. Its good to know other sista's from my continent embrace the lifestyle. Yes I have my bad days (cheese mostly and maybe 3 times a year) but I maintain strict discipline most of the time. Anyways thank you for sharing your story and much success to you. Thanks for this post. 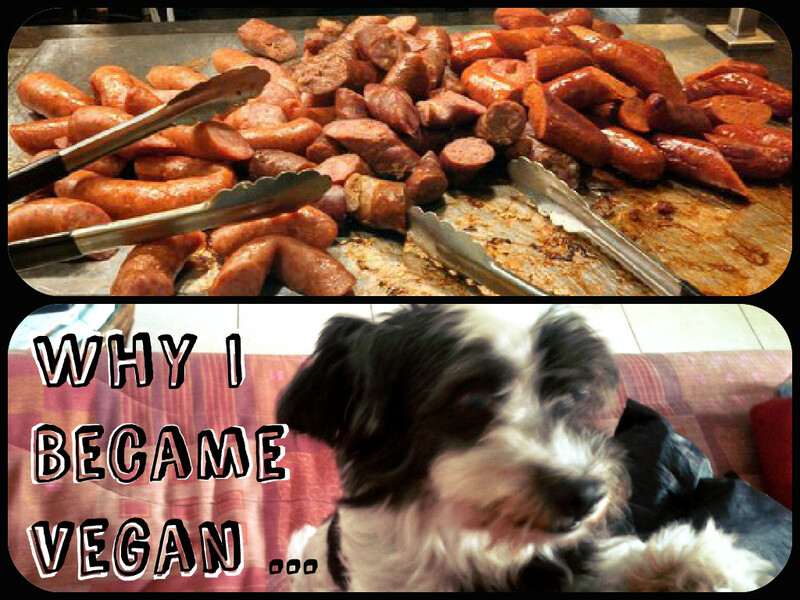 This last month has really broadened my horizon on the endless vegetarian / vegan possibilities. Please, keep sharing your recipes with us...vegan meals will feature in my daily diet henceforth. I have always wondered how you got here! It's really inspiring, I'm going to get Vegucated to! For years I also can't drink milk simply because of where it comes from but honestly, if I saw open guts splayed everywhere that would flip me too! But the health benefits are wonderful and your receipes are exciting, I'm going to try it! Thanks for sharing! Thank you so much for sharing this! Health is wealth. I became a vegetarian this year, but I don't eat eggs milk and tend to eat like a vegan 80% of the time, a brilliant decision. I may even do a blog post on this topic! I am so happy you shared this because it will encourage others to do the same especially our African folk. I'm still a student here in Nigeria, I don't have the luxury of buy these vegetables, there are some I can't even get around. Hi! Best tip I can give is to focus on the vegetables that are in abundance wherever you live. You don't necessarily have to go in search of obscure/expensive produce. Things like peppers, tomatoes, sweet potatoes, yam, efo leaves and plantain are relatively inexpensive and can be stored in the fridge to keep them fresher for longer. I'd also recommend buying dry ingredients in bulk..so things like bags of rice, beans, pasta etc...as this will last you longer and takes the stress out of wondering what to cook on a daily basis. With these core ingredients, you can make a wide range of meals from soups to stir-fries, sauces, roasted/boiled vegetables, salads etc. When it comes to snacking, fruit is always the best (and cheapest) option and it can be as simple as bananas, mangoes, oranges (or whatever is in season). Hope that's helpful! Thank you so much for sharing your story. I live in South Africa and since I am surrounded by all African cultures who are obsessed about one thing: "Ritual slaughter (culture) and meat" - now wait a minute ..... that is not quite true. South Africa is a rainbow nation and we have (just like the USA) various nations that have made the RSA their home. Irish, Scottish, English, Italian, French, Portuguese, Afrikaners (from Dutch decent) and they also ALL LOVE meat. Meat is South Africa's staple diet. But just like you, coming from a meat eating generation, I had my encounters with farm animals (having a tame chicken), I always had pets (a dog and/or cat) and grew up with a love for animals, but no understanding of how farm animals fitted into the picture (accept for meat). My questions only came much later, when I was in my late forties. It was only when I found out that the Philippines, China and other places in Asia (and even in Africa) eat pets (i.e. dogs and cats) that I started making the meat connection between companion and farm animals. I turned vegetarian and when I found out there are still cruelty involved even in being a vegetarian, so I made the final switch into veganism. The fact that you're Nigerian and your roots are very cultural and you were able to make the switch to veganism just confirms how strong and brave you are. I feel so blessed and proud to have found your blog. Thank you for this comment and for giving an insight into how you became vegan. I too feel blessed to connect with others who have made the connection and have taken steps towards changing their lifestyle - nothing beats being proactive. Wishing you all the very best on your vegan journey! First of all congratulations on embarking on a new journey, the way it sounds like you are following your inner instincts which will only lead to true happiness. Also it is really nice to read your story of how your journey to veganism began, I must admit there a few similarities to my own. Like the child-like intuitiveness that lingers, and simply pursuing those harboured concepts, questions and ideologies. Well done, keep doing what you do best. I am sure you are positively motivating others. Thanks so much for your encouraging comment and for taking the time to read my post. This was so interesting. Nice to read. Hi. I just want to say that I really enjoyed reading this, and your blog is lovely. Such beautiful food. I am from the UK where it's really easy to be vegan, it's good to hear about the challenges of being vegan in other countries/ cultures. I have a lot of admiration for people who turn vegan in such challenging circumstances. Apparently France is the hardest European country to be vegetarian/ vegan, as you say it's very meat/ dairy heavy culture and they don't really care much about animal rights. There is a British Nigerian vegan Youtuber- The Vegan Hustle who mentioned some of the challenges of turning vegan when coming from a meat heavy culture. You should check out the poet- Benjamin Zephaniah, a British Jamaican, who writes a lot about animal rights and 'species-ism' which is when we favour one animal (dogs, cats etc) over other animals (cows, pigs etc). This video explains species-ism and is what made me 'get it' and I was able to articulate better to people why I am vegan. If you really want to get heavier into it, you should read Eternal Treblinka: Our Treatment of Animals and the Holocaust. If you have watched Earthlings, then you should be able to stomach this book. It's the most harrowing book I've ever read, and describes the meat and dairy industry in great detail. It explains 'species-ism' very well. I've been trying hard since the beginning of this year to adjust to not eating meat. Sometimes I go for weeks without eating flesh then backslide. After discovering your blog this morning, and going thru ur recipes, i felt challenged to give myself fully to vegetarianism. Meat has never been the best article of food for man. God gave Adam a vegan diet. He later added meat as a makeshift diet after the flood because all plants were destroyed but man has clung to meat as though it were real food. What a pity! Hi Tomi, I just came across your blog today and I'm really excited by what I've seen. Its not everyday you find a Nigerian who so easily embraces this life. I'm not vegan. For a very long time I was blinded by the idea that we couldn't possibly live without meat and dairy or that people who chose this life were starving themselves (only a few months ago really). That's not the case anymore and though I do not completely share the same views you've shared, I have definitely agree that the over-reliance on meat is shameful. I fully take on the diet for a week every month, which might not seem much to someone like you, but it has opened my eyes and it has had immense benefits on my health and state of mind. Anyways, my point is I just thought you should know that it's not just vegans you are inspiring. Your page has definitely been a godsend, and who knows, it could extend to more than what I currently dedicate. A fellow vegan nigerian! I knew there had to be another! more Africans need to know this! I'm a loyal fan now, not letting you go! Hi Tomi. I'm not vegan however my journey here started when decided to find something simple I could do to combat climate change. It was a huge surprise to find out that animal agriculture is one of the largest sources of Greenhouse gases (Methane and carbon dioxide in particular). I have since been looking for recipes for plant-based diets. I envisage your page would be very helpful. Thanks for sharing. Please don't stop. Continue this. Do more.